Tonight we went to a restaurant to get some pie after going to a car show downtown. When we walked in to be sat, there was an older lady sitting at a table at the very edge of her seat telling a waitress something about her past. I could tell that the waitress was not interested in talking and was eager to slip back into the kitchen. Both Cody and I felt heartsick about this woman needing to come to a restaurant to talk to someone. She was lonely, and she wasn’t the only older person in the restaurant sitting alone. My youngest daughter was eager to move around and would interact with the woman with smiles and babbling. I think Brook brought her some cheer. Since then I have thought about how important family and friends are to our mental health. Whenever I hit lows, I have someone to talk to and to bring me comfort. I remember one specific time that I couldn’t deal with life and ended up in a corner of my dining room just sobbing. Even then, immersed in misery that I cannot really explain to you, every one of my girls came to give me hugs and kisses. Then Cody eventually came home and cared for the whole family like a champ. His concern was genuine. I had family and friends sense my struggle and anyone I wanted to talk to about anything, opened their ears and heart to me. I know without a doubt that my recovery is connected to the long talks on the phone, the friends who watched kids for me and my devoted family who, even as I tried to get away from them, showed me patience and love. When I think of people who are lonely, my heart really does ache for them. Life can already be difficult and even more so when you have to navigate it alone. In a study done by Maddy Loat (2011) in Mutual Support and Mental Health, she makes a case for treating mental health in groups instead of in isolation. To talk about mental health issues with others that deal with the same issues serves our “social natures.” Her book describes how mental health and mutual support would work, and how it could be provided and implemented. To be reminded that we are not alone in our struggles has value. I have been more open about my mental health struggles as I have learned how many other people I love and respect deal with similar trials. There is strength in numbers and to be understood is invaluable. I hope that everyone can build connections with others, especially those that will care unconditionally. My dear mother hears from me more when I am struggling than when I am doing well. I think it is the same with my prayers to Heavenly Father; my prayers are more sincere and frequent when I am in need. Thank goodness they are consistently supportive since, in a study by Haine-Schlagel and Walsh (2015) in their article “A Review of Parent Participation Engagement in Child and Family Mental Health Treatment,” it shows positive outcomes for children who have parents involved with their therapy. I am thankful for parents who will listen to me during the good and the bad. Who is your go-to when you need to talk? 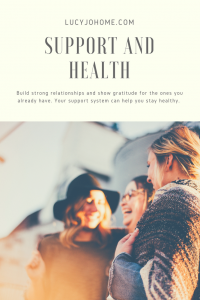 Also, family and close friends are the best kind of support, but larger, less intimate groups of people can also bring you comfort and backing. I am a part of a women’s organization through church, an exercise group through Beach Body, and I spend time in blogging and photography groups online. These communities have been motivating and positive in my life. Filling your life with people who care about similar things can bring you joy and support when you need it. What communities are you a part of that lift you? I hope you are feeling good and treating your mind and body well. Give an extra hug or a thank you note to someone that sits and listens to you, that understands you and still loves you. Listen to someone that needs your love and or support. Loat, M. (2011). Mutual Support and Mental Health : A Route to Recovery. London: Jessica Kingsley Publishers.